Doctor booking platform is one of the emerging online services in the current scenario. For a starting phase of finding a medical professional, there is a lot of healthy scopes available in the market. Since finding doctors in offline is quite tuff and the people who don’t have the patience to wait a bit for an appointment, technology has improved and hence doctor booking becomes sophisticated for the doctor as well as visitors. The growth of healthcare industries is incredible as the past. Visitor dashboard was clear and you can navigate easily across the website, can search the doctor by listed categories or by location. Through our Physician Booking Script, visitors can view doctors list, doctor details like fee, business timings, license information and reviews and ratings. As a registered user with valid credentials, they can update their profile with images. On booking appointments can view their booking status in their appointments, once the information is passed might receive the email from the booked doctor, if that doctor accepts or declined the appointments. Hence the user can write reviews about the medical professional according to the satisfaction. 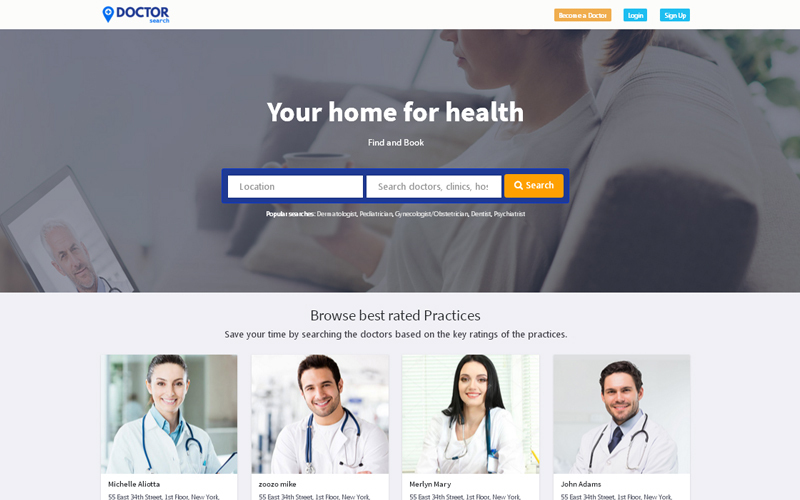 A medical practitioner can become a registered doctor by clicking become a doctor button on the top right corner in the Doctor Search PHP script. The user has to fill out the basic doctor details like license id and proof, experienced divisions. By the way, admin can accept or deny the request through some valid criteria. In Doctor Dashboard, registered doctors can submit their further details like fee, business timings, and years of experience. Can view the user’s appointments and might accept or decline the user’s appointment based on the schedule. Admin plays important role in managing a doctor-booking website. Admin can view total registered users, doctors and reviews count. Privilege to manage Location like Country, State, and City list. As Medical Appointment Script php is developed with open source PHP and MySQL platform which supports enabling unlimited categories and subcategories since millions of user database can access. Admin have to manage platforms like user management, doctor management like activate or deactivating doctor account, user reviews can be activated or deactivate and delete, appointment management, user feedback managing, and ad management etc. Hence it is declared that a budding entrepreneur has a bright future for starting the Medical Appointment Website within a day. To the fact revenue models are the major concept behind the scenario, the earning process made easier through Google AdSense, Banner Advertisement, and featured membership plans and more. If you have more query our tech experts are ready to answer your queries, kindly shoot us a mail.